Tiritiri Action Group (TAG) is not against the formation of marine reserves but believe they should be part of a regional and strategic national plan. We do not consider the NZ Biodiversity Strategy a satisfactory plan to address marine reserves. The formation of reserves should include those affected in the earliest stages of planning so issues can be debated and ownership of the solution becomes a community issue. TAG does not support justification of the proposal by New Zealand Underwater Association (NZUA). The proposal does not conform to the purposes of section 3 of the 1971 Marine Reserves Act. There are serious safety, social and economic concerns about the proposal. There is currently more than 10% of the local coastline under marine protection. The proposal places an additional unfair burden of marine restrictions on the local population. Biodiversity issues need further qualification of criteria that need to be met. Fisheries management arguments are not a plausible justification for this reserve. The area proposed has a sewage outlet. Historical, geographical and cultural justifications are questioned. TAG is critical of the timings of release of the document and early closure date for submissions. The subsequent extension was poorly advised. TAG is critical of mass submissions from national activist groups that can over ride majority community opinion against the proposal. The Minister of Fisheries is unlikely to concur as is required under the Marine Reserve Act when recreational fishing rights will be impinged. The proposal should wait until the completion of the review of recreational rights and the government’s Oceans Policy. Concerned members of the public formed the Tiritiri Action Group (TAG) in January 2003 in response to the proposed reserve by the NZUA released in December 2002. Weekly meetings were held in the Hibiscus Coast Boating Club (HCBC) at Stanmore Bay by key members with the sole purpose to help raise awareness of the reserve proposal and co-ordinate opposition to it. TAG are of the belief that there is insufficient public support in the Rodney and surrounding districts for the proposal to proceed to the formal application stage. This submission represents the views of the committee of TAG and signed by the chairman. It is the TAG committee’s case against the proposed reserve. TAG has encouraged individuals to make their own submissions. TAG convened a meeting Tuesday 4th February of invited members of various backgrounds to discuss the proposal. Raising funds to place public newspaper adverts against the proposal, print and distributed submission forms and staged a public rally at the HCBC Thursday evening of 13 th February. NZUA was invited to attend and speak at the rally but declined the invitation. TAG has also informed a number of national and local organisations/clubs that may be affected should the marine reserve proceed. The TAG group has an elected committee of a chairman, treasurer and secretary who have called for public support to further the aim of the group. That aim is - the Tiritiri Marine Reserve should not proceed as proposed and further proposals should wait until a co-ordinated national and regional plan of marine protected areas is formulated. There are a number of relevant facts that leads TAG to its main aim. These are amplified as follows. The proposal has been written quoting the Marine Reserves Act 1971 as the tool in which the reserve will be eventually formed under. However we find in the justification very little that conforms to the Act that would enable the proposal to meet the requirements of this Act. Certainly marine biodiversity and representative areas are not part of the purpose of the current Marine Reserves Act, which are the prime reasons offered by the applicant why the area chosen should be considered for a reserve. In fact we find the selected area has little in common with section 3 of the Act to justify its formation. The proposal quotes the Auckland Regional Council policy statement of 10% goal of the coastal area being fully protected marine reserves. Such policy places an unfair burden on the residents and visitors who fish around Whangaparaoa Peninsula and Tiritiri Matangi Island for recreation or sustenance. Currently there is well in excess of 10% of the surrounding area within the Rodney district already fully protected or has no fishing allowed. These include the Long Bay and Cape Rodney- Okakari Pt (Goat Island) Reserves, Tawharanui Marine park, a number of cabled areas including the substantial international telecommunications cabled area adjourning the proposed reserve area, Naval Degaussing area and danger area when live firing take place at Whangaparaoa Naval Range and disused explosive dumping zone south of Tiritiri Island. The attached chart highlights all the current no fishing areas in close proximity to the NZUA proposed marine reserve. In addition to this will be marine aquaculture management areas presently under formation that will effectively rule out the use of these areas for any recreational purpose. To add to this the 10% target of areas in full marine reserve protection would deny a substantial proportion of fishable water to the residents and visitors to the region on top of those areas closed to fishing for other reasons. Further if the 10% was applied to the most productive fishing areas which tends to be the targeted areas for reserves, then recreational fishing becomes an activity exclusive to those who have suitable boats and time to travel the distances required to reach a productive area not restricted to recreational fishing. TAG submits there is a serious safety issue if the reserve was to proceed. To remove the most accessible and productive fishing area around Whangapararoa that has shelter from most wind directions will tempt fishers to proceed further afield in search of a catch. There are a high proportion of small craft that frequently fish the proposed reserve area due to the protection it offers craft in any prevailing wind and sea condition along with accessibility and productivity. A further safety concern is for the many groups and individuals that would be attracted to the reserve who are not aware of the risks to crossing the Whangaparaoa Passage in small craft. While common sense and good seamanship should prevail there will always be those tempted or caught out by conditions unsuitable for their craft. Further demands on the marine search and rescue service, whilst difficult to quantify, will inevitably rise. The immediate proximity of the large cabled area next to the proposed marine reserve will result in more incidents of recreational fishers attempting to anchor and fish in the cabled area. The no fishing cabled area extends beyond easily recognisable geographic features to assess position. Unless boats are fitted with GPS plotters or anglers take considerable time to fix their position with bearings they will be tempted to inaccurately assess their position. This being encouraged by wanting to stay as close as they can to the safety of land shelter and the better fishing normally associated with seabed features near land. While a prohibited activity and one that is not condoned, a situation will occur if the marine reserve proceeds that will promote more careless but unintentional intrusions into cabled areas by both novice and experienced fishers. Whangaparaoa and Orewa region has a high retired population and many choose the area because of the availability of recreational and sustenance fishing close to home and by the use of smaller boats or surfcasting off rocks. The same argument applies to families who chose to live in the area because of the easy access to surrounding fishing and availability of work in the commutable area. The proposed area for reserve status is widely recognised as the most productive in the region for fishing with easy access and distance from boat launching facilities or beaches for light craft. To remove this area will eliminate a prime motivation for many that moved into the region. The proposed marine reserve constitutes a huge threat to the local population due to the limited income of the retired and those fishing for sustenance purposes. For many the proposed area is the only place they can source fresh fish at a price they can afford. To deny those who choose to live in the area an opportunity to gather food for themselves is a factor that has not been considered in the NZUA proposal. There will be economic factors that should be explored before any decision is made on future reserves within the region. A study commissioned by MFish (REC9801) into the economic value of recreational fishing, showed nationally that recreational fishers spent 973 million dollars annually in recurring expenses in the pursuit of just five popular recreational species – Snapper, Kingfish, Rock Lobster, Blue cod and Kahawai. This survey is widely regarded as conservative as it underestimated the proportion of public that fish, based on the results of a later survey REC9803 for MFish. The recurring expenses do not include capital equipment costs such as boats, motors, rods and reels, which while one off costs would substantially add to the total. Given the popularity of fishing for recreation within the region then a substantial proportion of this annual expenditure is spent within the region. While this could be broken down pro-rata in terms of population, this also would be conservative. Targeted research should be commissioned to get more relevant data on the reduction in economic benefit within the region if it is no longer an attractive place to fish. Marine biodiversity is offered as prime justification for this particular proposal. As said earlier this is not consistent with the current Marine Reserves Act but in support of this logic the NZ Biodiversity Strategy is offered. This strategy is less conservative than the Auckland Regional Council policy in that its action plan includes 10% of marine protected areas rather than reserves by 2010. The plan does take into consideration currently protected areas other than marine reserves. As stated earlier the Rodney district has already achieved this as a region. However there are some arguments that need qualification. TAG is not against the formation of reserves outright or the pursuit of maintaining marine biodiversity. The formation of reserves should be initiated by a fully explored and debated action plan by all interested parties and not by various interest groups with self appointed agendas to fulfil. These plans by necessity would have to be regional in nature and able to fit into a national plan to achieve the same. The Biodiversity Strategy does address some of the issues but lacks a good definition of what is an acceptable level of biodiversity. This requires defining so that the impact of existing mobile marine species has on the quality of biodiversity in that area can be assessed. To not have this leaves the NZ Biodiversity strategy open for abuse as justification for large tracks of coastal waters to be locked up permanently in reserves. TAG is opposed to the justification of having marine reserves surrounding terrestrial sanctuaries such as Tiritiri. They have no beneficial or detrimental effect on the rare and endangered species on the Island. Access to the island can be effectively controlled with current restrictions and will not be enhanced by the protection of a surrounding marine reserve. If this justification were accepted then the waters surrounding almost all offshore islands would be targeted for marine reserves. This is a situation that would be strongly opposed by the fishing public. TAG is not opposed to a suitable area being placed into marine reserve on the grounds of scientific research. However we find little to justify this proposal under these terms. We ask what scientific research can be carried out in this locality that is not presently available because of current fishing practice or could not be accommodated in existing reserves. TAG submits that any area proposed for reserve status should be with the consent of the majority of the local population that utilises the proposed area. This proposal did not effectively seek the endorsement or views of the local population before NZUA and its supporters devoted considerable time and expense to the project. Had it done so and received endorsement then the reaction that it has now received against the proposed reserve could have been considerably mitigated. It is highly unlikely that the current proposal would have been endorsed but suitable alternatives acceptable to majority may have eventuated. TAG does not support the representative area concept proposed by NZUA. There is no provision for this in the current Act. Should the current Marine Reserve Bill eventually modify the act to include representative areas, then we are confident that suitable alternatives could be found without the need to lock up large tracks of the best fishable waters found near the Whangaparaoa Peninsula. NZ has one of the best management systems in the world and using implied justification that fish stocks need reserve protection for management reasons shows contempt for our present system. Marine reserves for management reasons are a last ditch system in countries where there is no or little proper management of their stocks and subsequently face over fishing both commercial and recreationally. In a balanced fishery such as New Zealand’s stock recruitment is a function of favourable ambient sea conditions. The influence of a number of reserves in virgin state scattered around the region is minimal. Some would say the difference would be negligible. While undoubtedly local resident populations of some fish will increase in number and size in a protected reserve the benefits of this are questionable. Spillover is a conservationist myth as all current reserves tend to attract fish into the reserve and may deplete surrounding fishing areas. Scientific supporters of the Poor Knight reserve openly claimed that snapper stocks had increased 10 fold within a year of that area being given full marine reserve status. While not critical of the Poor Knights area as a reserve it is just plain fanciful to believe that this was caused by natural growth within the reserve, the majority of this increase was caused by attracting fish into the reserve from other regions. Fishing near an existing reserve in the hope of a productive catch is the activity of a novice fisher and one that they soon learn is a waste of time. We note that two of the proposed three area options have a sewage effluent out fall. The current Marine Reserve Bill will if passed in its present state, deem these to be inappropriate areas for reserve status. Uniqueness of Tiritiri and Whangaparaoa geographical features. Specifically the shore platforms around Tiritiri and the cliffs and intertidal platforms around Whangaparaoa Peninsula. While these may be unique features to the area we ask what danger do they face that they need full marine reserve protection. Recreational activities including fishing pose no risk to these features. If subsequently an activity was identified and agreed by local and national bodies that it posed a risk to the area then this activity could be specifically excluded within the at-risk area by use of regulations under the Fisheries Act. Historical justifications have no support within the current act. Even within the new marine reserves Bill sections supporting historical areas as a justification for marine reserves are tenuous and we await the outcome of the select committee to see if these remain part of the Bill. We argue that the wreck of the Royal Tar has limited historical value and is not threatened by fishing activity. Issues of cultural significance in the marine environment are best left to Iwi to pursue with the numerous tools they have at their disposal for each issue. To pre-empt that a marine reserve status for this area serves Iwi best is an injustice to them and bound to invite criticism, but we will leave this for local Iwi to contest. TAG formally complained by letter to the NZUA at the timing of the release and discussion period of their proposal. To release this just before the nationally recognised holiday period of the traditional Christmas holidays is viewed with suspicion as to its intent. The letter dated 10th February 2003 asked for an extension due to insufficient notice and useful period of dissemination of information and adequate time to respond. With three days to go, before submissions closed we were advised by telephone that the deadline had been extended to the 31st March. Earlier advice of the extension would have been appreciated, as it appears that at this informal stage this should have been easy to grant. It subsequently became known to TAG that a press release circulated within the NZUA membership and to the NZ Forest and Bird Society stated that a decision to extend the deadline was made on 17th of February. The fact we were not advised at the same time was poor administrative handling. With the contempt we have apparently been shown, we have grave doubts that a logical decision regarding the analysis of the submission returns is likely. TAG is critical of practices that encourage mass submissions by recognised national conservation organisations with little connection to the area concerned. The Whangaparaoa and Orewa area has an estimated 30,000 population. If every man woman and child responded against this proposal it would still fall short of a majority influence when just one organisation such as Forest and Bird Society has 70,000 subscribing members NZ wide and has encouraged all its members to submit in support of the proposal. This makes a mockery of the submission process and can force the agenda of a national environmental action group on a local population against their will. Presently, compared to Maori customary and Commercial fishers, the public’s right to access and harvest food from the marine environment is poorly defined. While recreational fishers have rights, the access issue is at the discretion of the Minister of Fisheries to uphold. This is currently under review by the Minister of Fisheries with a goal of legislation change within the Fisheries Act 1996 to better define the rights of the public to recreational and sustenance harvest. This review will better define the interaction with the other main stakeholders and relationships with other legislation such as aquaculture, marine protected areas and marine reserves. Also the government is actively creating its Oceans policy which is still in draft but will also describe public good relationships within the marine environment. The formation of the proposed reserve will, without doubt, affect the local and visiting fishers ability to take fish and therefore impinge their rights. TAG submits that the NZUA proposal should wait until the completion of the review of recreational fishing rights and completion of the Oceans policy. Until these reviews are completed there is little legislated and policy guidance as to the needs of the reserve compared to the disadvantaged public fishers. Under the current Marine Reserves Act it is unlikely that the Minister of Fisheries will give his consent which is required, when recreational fishers will be seriously disadvantaged. Using the Triple Bottom Line factors of social, economic and environmental impacts on the local community, this proposal does not comply. 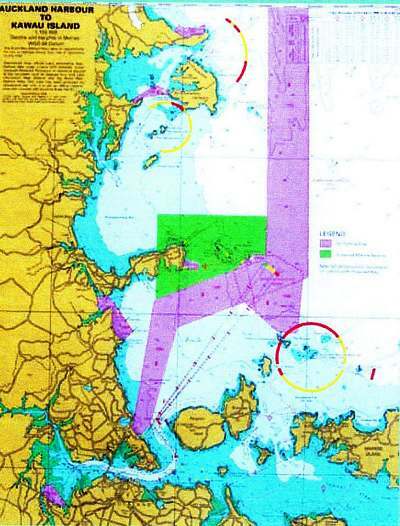 TAG also considers this proposal to have undue and adverse affects on existing use of the area for recreational purposes as per section 5 of the Marine Reserves Act part 6 (d), therefore TAG opposes this proposal on these grounds and the points already stated. Thank you for the opportunity to have our input. It has been very valuable in gauging public opinion on a marine reserve in this area. Local chart showing existing reserves and prohibited fishing areas in relation to the NZUA proposed reserve area.